CNG: eAuction 436. GREEK. Magna Graecia & Sicily. Lot of two (2) Gela bronzes. 436, Lot: 1059. Estimate $100. GREEK. Magna Graecia & Sicily. Lot of two (2) Gela bronzes. 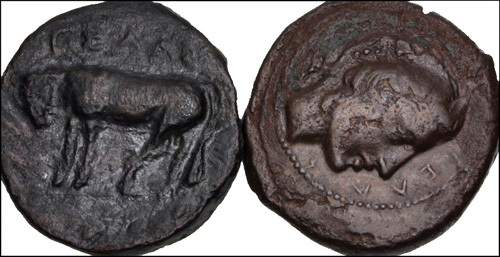 Includes: Bull standing left / Wheel of four spokes; barley grain in each quarter // Bull standing right / Horned head of Gelas right. Average VF, the first heavily tooled, the second with control mark obscured by porosity. LOT SOLD AS IS, NO RETURNS. Two (2) coins in lot. Closing Date And Time: Jan 23, 2019 at 3:53:00 PM ET. Current Date And Time: Apr 23, 2019 at 11:55:06 PM ET.